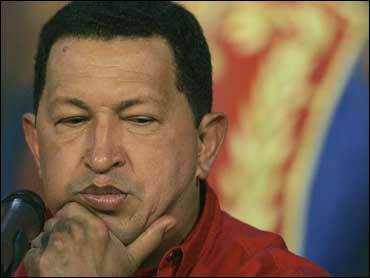 President Hugo Chavez on Friday accused neighboring Colombia and the United States of plotting a military "aggression" against Venezuela. "I accuse the government of Colombia of devising a conspiracy, acting as a pawn of the U.S. empire, of devising a military provocation against Venezuela," Chavez said. "A military aggression is being prepared," Chavez added, saying that Washington aims to "oblige us to respond, and later a war could be set off." He cited intelligence reports but did not offer evidence to support his claim. Venezuela and Colombia have been locked in a diplomatic crisis since November, when Colombian President Alvaro Uribe ended Chavez's mediation role with Colombia's leftist rebels in seeking a hostages-for-prisoners swap. Chavez warned Colombia not to attempt a "provocation," warning that it would trigger a decision by Venezuela to cut off all oil exports. "In that scenario, write it down: the price of oil would reach $300, because there wouldn't be oil for anyone," Chavez said. "The invaders would have to step over our dead bodies." Chavez has repeatedly accused Washington of plotting to oust or kill him, though it was the first time he has accused Colombia's U.S.-allied government in such strident terms. He spoke as U.S. Secretary of State Condoleezza Rice was in Colombia, saying she and two other senior American officials who have visited Bogota recently "came to attack Venezuela" in their remarks. Rice did not mention Chavez during her earlier public statements in Colombia. Cesar Mauricio Velasquez, spokesman for Uribe, said his government had no immediate comment. The trouble between the two countries began in November, when Uribe accused Chavez of overstepping his authority by directly contacting Colombia's army chief while trying to broker the prisoner swap. Chavez responded by freezing contacts with Uribe and calling home the Venezuelan ambassador in Bogota for consultations. That ambassador has yet to return. Chavez has continued his contacts with the rebels, though, and earlier this month the largest guerrilla group freed two Colombian women held captive for years to Venezuelan officials. The Colombian government later reacted with outrage when Chavez urged world leaders to stop classifying the rebels as terrorists. Chavez said he expects relations with Colombia, which he and Uribe once managed to maintain cordial, "are going to continue deteriorating," predicting that it will hurt cross-border trade. Chavez said the United States and the Colombian government "don't want peace in Colombia because it's the perfect excuse to have thousands of soldiers there, the CIA, military bases, spy planes and who knows what other trash operations against Venezuela." The Venezuelan leader, a close ally of Cuban leader Fidel Castro, said President Bush and his allies "think we are against the ropes, that we're weakened right now. Well, be careful."